Ann Arbor dot com captured us dodging rain drops, well cold chubby rain. It is a nice little write up. After 2 days away. 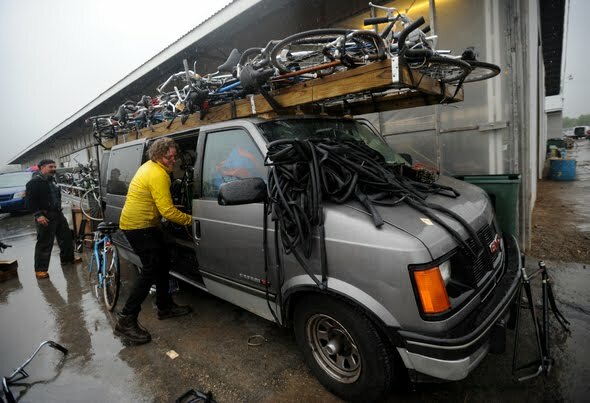 Since then, we then bought another 20+ bikes, including a tandem. The line leading into swap meet. The line actually starts the night before. A lot of secret and not so secret bike sales happen on line waiting to get in. Flashlights and money in hand. Mostly balloon tire bikes. Descriptions to follow. Very cool schwinn Aerocycle. Prewar, 1938ish. This is the bike PeeWee Herman wishes he had. One switch on the handlebar activates the horn, another switch illuminates the speedometer on the crossbar of the handlebars. Great looking pile of bikes- Shelby Donald Duck bike, Whizzer, etc. Rainy day at a swap meet. . 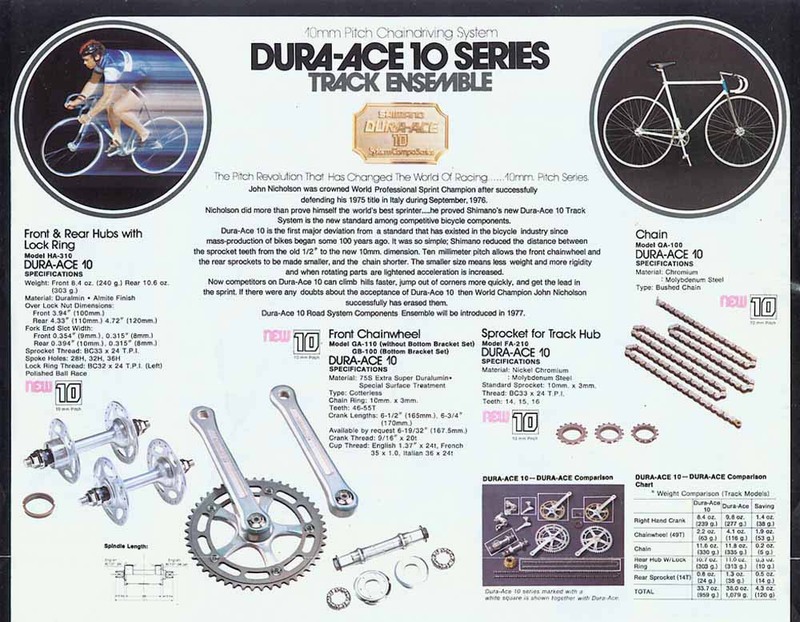 The Schwinn demonstrator was offered over a long enough period(estimating around 10 years) that collectors can find them with different era derailleurs and shifters. All the ones I have seen have been equipped with Huret gear(some labeled Sprint, but mostly "Schwinn Approved"). I have come across French ones in my travels as well, one Peugeot and one Gitane. They were both equipped with Simplex rather than Huret and Stronglight cottered cranks. Some more pics. Looks like today is going to be beautiful. Some rare bikes here for sale. Too rich for my blood. Swap meets are a lot of hanging around trucks. I have a friend that is looking for a tandem bicycle. 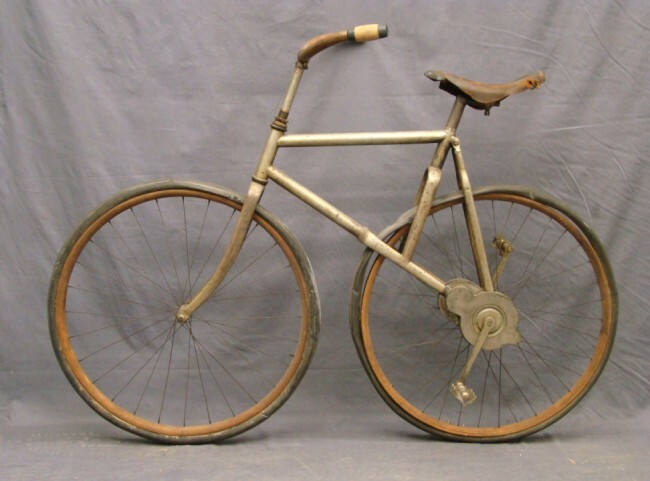 This frameset, 1889 Singer Tandem Trike, would be a nice start to build up a nice rider. It would be a pricey build up though. $14,500 start up, plus paint and parts. 1890''s Bronco style cross frame pneumatic bicycle. With bicycles in it's infancy, there were some weird and wacky designs out there. $8,600. 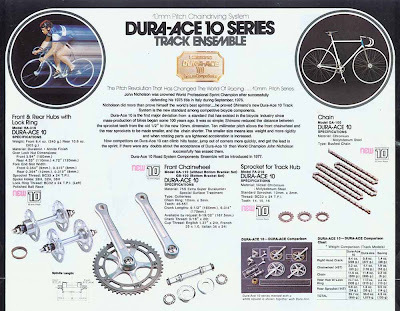 For Sale- Shimano Dura Ace 10 Pitch cranks and wheels. The cranks are 165mm long, and have a 48 tooth chainring. the wheels are mismatched. the rear is 28 spoke and the front is 36 hole. Tubular rims. 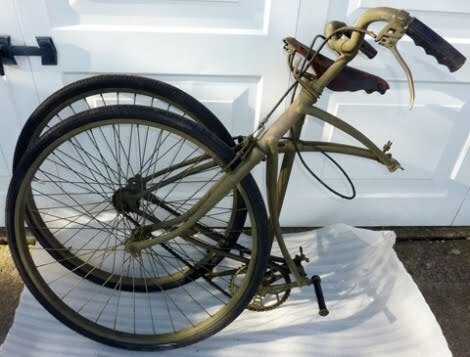 A customer brought in a wartime BSA Paratrooper bicycle. 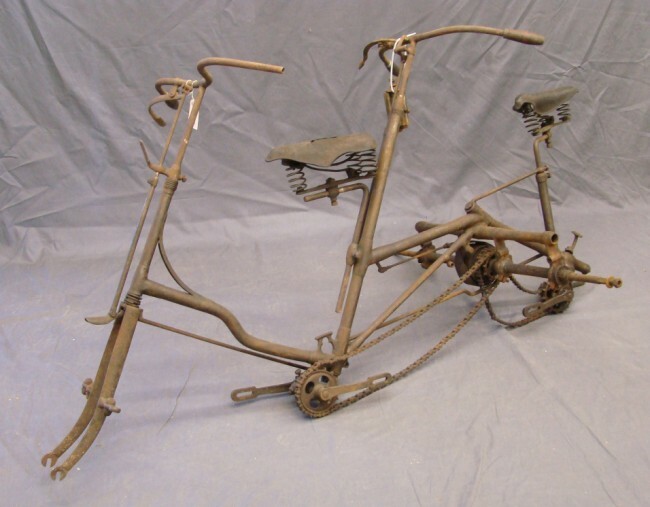 The bicycle folds in half and was used in service by British paratroopers, during WWII. 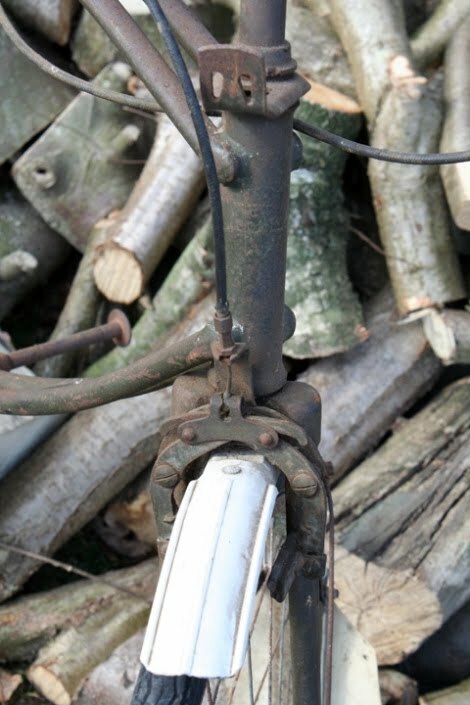 We are looking for a set of brakes, unique to the bicycle, not sure if available on other model bicycles. 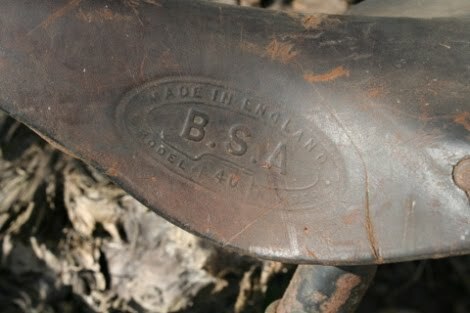 And we are looking for the BSA saddle for the bike. "Analysis of the serial numbers indicate that over 70,000 were made. They are now considered to be rare, and collectible. Many were sold surplus after WWII for as little as Canadian $3.95 from Capital Iron in Victoria BC, to Cdn $9.95 from the Hudson's Bay Company. 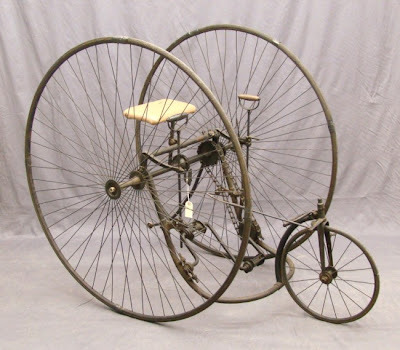 The early airborne bicycles had twin columns under the seat. Later models, which appeared sometime between serial numbers R8000 and R13000 had a single column under the seat. These bikes are often called "parabikes" by collectors, but so far it seems that this is an erroneous term. This appears to be a post-war nickname applied to a commercial variant. The only war time manual references found so far clearly call it the "airborne bicycle". The bike was designed to be folded in half and carried on board an aircraft. It could be landed by glider, thrown out of the aircraft with its own small parachute, or carried by a paratrooper as he jumped out of his aircraft. It was NOT carried on his back as some authors have suggested, as he had his parachute there. 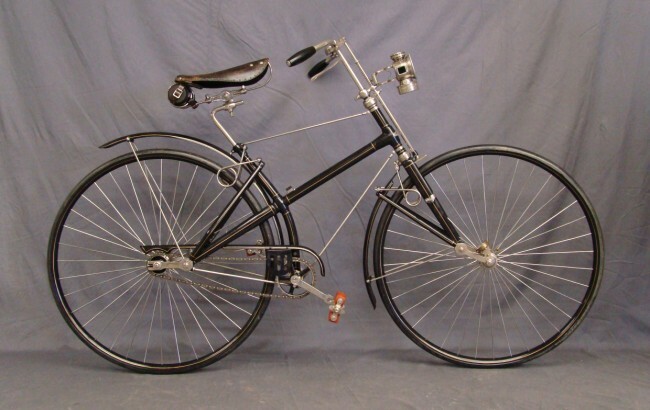 By the time of the big invasion of June 1944, larger gliders were available and other larger vehicles were available, so the folding bicycle was already obsolescent. The paratroopers disliked them and the main combat use was by infantry in the second wave on the British (2 beaches) and Canadian (1 beach) on D-Day, 1944 June 06. The other two beaches were American and they did not use them apparently. The soldiers disliked the bikes intensely and most were discarded within a few miles of the beach." Ben Hur headbadge. 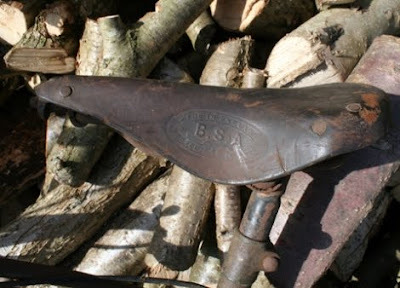 It was a turn of the century bike, built in Philadelphia. 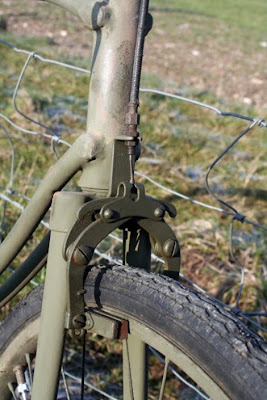 Interesting routing of the front derailleur. This was on a 1960s German road bike. New departure "devil" bell. This was in the catalog as a Pluto bell. One of the rarest and most desirable bell. I would love to have this bell, but the price reflects how rare it is. 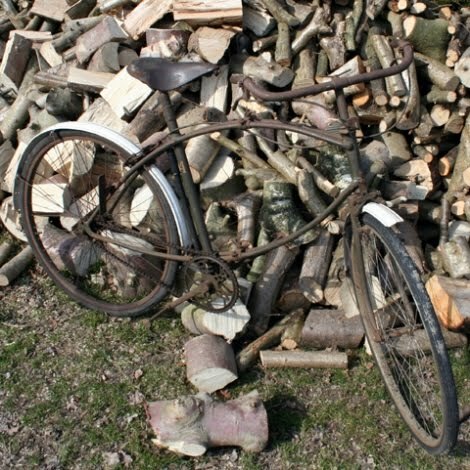 recently unearthed track bike. Old hang tag list it as a Kopsky, A six day race bike builder. A very nice pair of Raleigh Clubmans for sale. they both sold. There was a total of 4 Raleigh Clubmans for sale there! Small world story- Well we featured a possible Flying Scot bike on the blog a couple months ago- HERE- and at the same time we were setting up that bike as a round the town city bike, this Flying Scot came to the shop for a similar treatment. They both wanted it set up as a single speed, with upright handlebars and fenders. One is a fixed gear and the other is a single speed with a freewheel. Here's where the story gets weird (especially because we are in Philadelphia, not Scotland), the two customers are ex-roommates. What a coincidence! This one is outfitted with Honjo Fenders.Montmantre handlebars, brake levers from Velo Orange, a rare underslung stem, Mafac Racer brakes, Campagnolo Tipo hubs, and Stronglight cranks from us at Via Bicycle.